This Monkey's Got the Sneezes! Do not get between a cat and his nip! Enjoy! 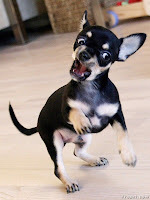 And don't forget to enter Cute's latest doggie giveaway! Not sure exactly why I think this sneezing monkey is so funny... maybe it's just the randomness of it. Ahhh! The wedgie monster strikes again! What a great kitty exercise machine, though! I love how they take turns jumping on and booting each other off -- reminds me of jumping rope Double Dutch. Then, how about some fat cat exercises, please. First there was Nora, the piano-playing cat... now here's Dua -- a talented otter that plays the keyboard! The nice people at the Monteray Bay Aquarium in California taught Dua this cute musical skill to give him different and interesting to do, and also make his feeding time a little more fun! And now, without further ado... Here's Dua! 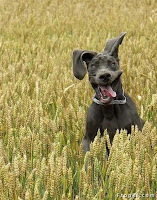 Do you have a cute doggie picture? 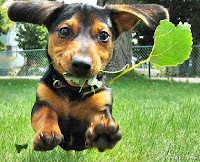 Email it to me at dorian at yourdailycute dot com and you could be on the Cute! Attention doggies and doggie-lovers! 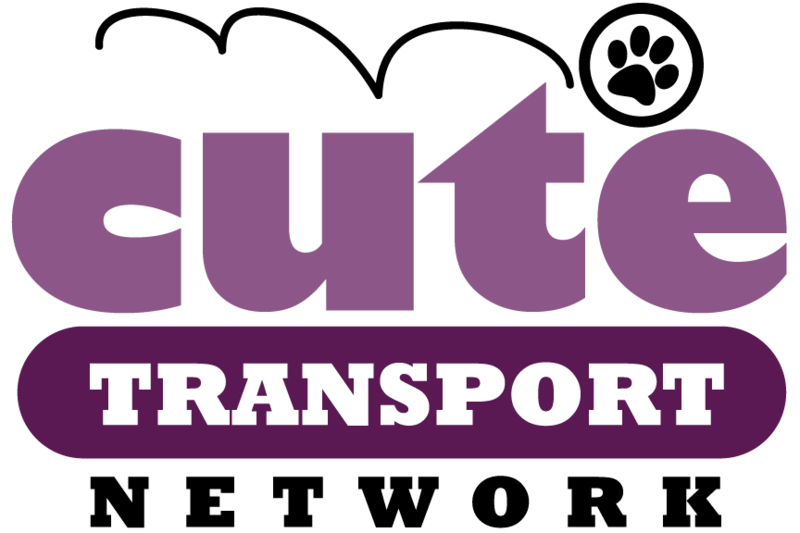 Cute has a giveaway contest just for YOU! Click here to see what we're giving away! This cat in a suitcase is a lot like a Jack in the box! Any cat owner who's ever tried to pack know the cat WILL go in the suitcase. It's mandatory. I'm pretty sure it's written in the Rules of Cat somewhere. Cute Giveaway! 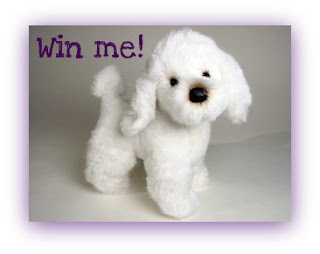 Fluffy Doggie Plush Toy - Enter Here! UPDATE: This giveaway has closed! See who Pimp picked as the winner by clicking here! 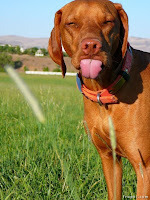 Attention doggies and doggie lovers! 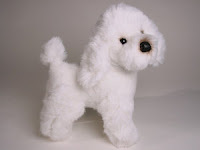 Your Daily Cute is excited to announce our latest giveaway contest -- for this incredibly sweet-looking stuffed dog from CatsPlay.com! We've named him Snuggles, but you can rename him when you get him home, of course. And Snuggles isn't your average fluffy buddy either... he's a genuinely barktacular Italian handmade collectible (valued at $109). 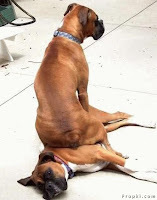 Whoa, doggie! Snuggles would make a great pal for people, pooches -- or even purries! 1. Leave a comment below with your favorite post you've ever seen on Your Daily Cute (there are some links over there on the left to give you ideas). That's it! All entries must be received by 11:59 p.m. EDT Sunday June 21. My cat, Pimp, will be choosing the winner (he's done this before, of course). The lucky winner of Snuggles will be announced Monday evening -- so be sure to check back on the Cute then to see if you get to snuggle with Snuggles! 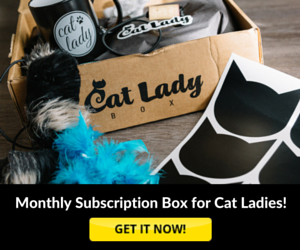 CatsPlay.com is well known for having the most extensive collection of incredible, customizable cat furniture on the web -- it's like a cat owner's paradise! But CatsPlay wants shoppers to know that dogs are welcome, too! They sell a wide variety of pet carriers, pet beds, pet collars and other products for dogs, too. 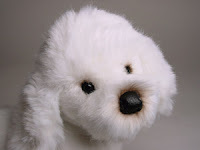 In addition, they sell unique gifts for dog and cat owners, such as this exclusive lifelike stuffed 12-inch Miniature Poodle, handmade in Italy by Piutre. The Piutrč Animal Collection is unquestionably the finest collection of realistic stuffed animals in the world. The animals in the Piutrč Collection faithfully replicate their real-life counterparts in form, coloring, dimensions, and expression. Each piece is sewn, shaped, and finished entirely by hand in Italy, using the finest European-made materials. Retail value $109! We all know you're supposed to wear a helmet before hopping on your bike or motorcycle... but did you know they make helmets for dogs, too?! Until seeing this cute Welsh Corgi sporting his helmet in the video below, I never knew they made dog helmets! What a great idea -- cute and protective at the same time! 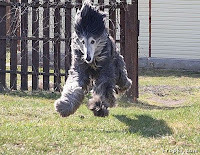 Thanks to our Twitter pal @grpetsupply for pointing this one out! Thinking about spending a bunch of money on a professional massage at a spa? No need! Simply find your nearest kitty and let him go to work. Purr vibration for deep tissue treatment bonus at no additional charge! His only two jobs around here are eating and sleeping -- not much to ask, right? And yet, here he is lying down on the job! I'll have to talk to that (cute) slacker.